You are currently browsing the category archive for the ‘pastured beef’ category. A recent Kim Severson story about a New Mexican steer-share identified the beef shank as among the animal’s more challenging parts to cook. Which was good to hear. Our shanks always seem to sit in the freezer while we eat our way through the steaks and roasts and more recognizable parts. It’s probably because these things are really tough mothers, dense with fibrous connective tissue and sinew, that makes them such a test of kitchen skill. Bill Buford cooks down shanks with a bottle of red wine and a few generous tablespoons of ground black pepper, and he claims that after a day’s braise few things are more tender or flavorful. But we’re talking beef stew here; how different can it be? Braise your beef in wine plus or minus tomatoes, and I’m not convinced it matters overly whether you layer in bacon, onions, garlic, mushrooms, herbs, pepper, or other flavorings, or whether you choose beer as your flavor base, because the beef taste is often totally overpowering in long-cooked food. So I was pleased to find that red curry stands up to beef in much the way that red wine does, while also lending spice and complexity. You can add ginger, turmeric, cumin, kaffir lime — even cinnamon and cardamom — to the mix, and you’ll get a beef braise that’s decidedly different than the usual Euro fare, especially when served over steamed rice or seasoned rice noodles. Consider this recipe a starting point. Play around with the flavors, and if you like add sliced mushrooms and red bell pepper about 30 minutes before finishing; I think the vegetables add nice balance to this meaty dish. Rinse and dry beef shanks. In a shallow dish, mix flour with ½ tsp salt and several grindings of pepper. Coat shanks with mixture. Heat a heavy stewpot over medium-high heat. Swirl in 1 tbls vegetable oil, coating bottom of pot. When hot, brown shanks on each side, about 6 minutes per side. Remove and set aside. Add another splash of vegetable oil if pot is dry and swirl to coat. Add onion, carrots, and garlic and cook, stirring, until vegetables are softened, about 5 minutes. Stir in curry paste, cumin, coriander, and turmeric. When spices have released their aromas, about 1 minute, add coconut milk and stock or water and stir, scraping up and incorporating browned bits into the liquid. Stir in kaffir lime or bay leaves and return shanks to pot. Add additional water to cover the shanks if needed, bring contents to a boil, then turn heat down to a bare simmer. Cook three to four hours or until meat is very tender. Remove bay leaves if you used them and coax meat away from bone. Serve over rice or seasoned rice noodles, with optional garnishes, and toss bones to the dogs. It’s equally good / perhaps better the next day. Feeds 6-8. Serve fresh Thai cucumber pickle alongside. The New York Times reveals why it’s so confusing to keep straight all those different cuts of beef: grocers, butchers, and even the Cattlemen’s Beef Association are forever designing new cuts with fancy names to upsell meat that’s traditionally turned into ground. Argh. Not really the kind of help I was looking for. It’s April, and beef stew is so over. 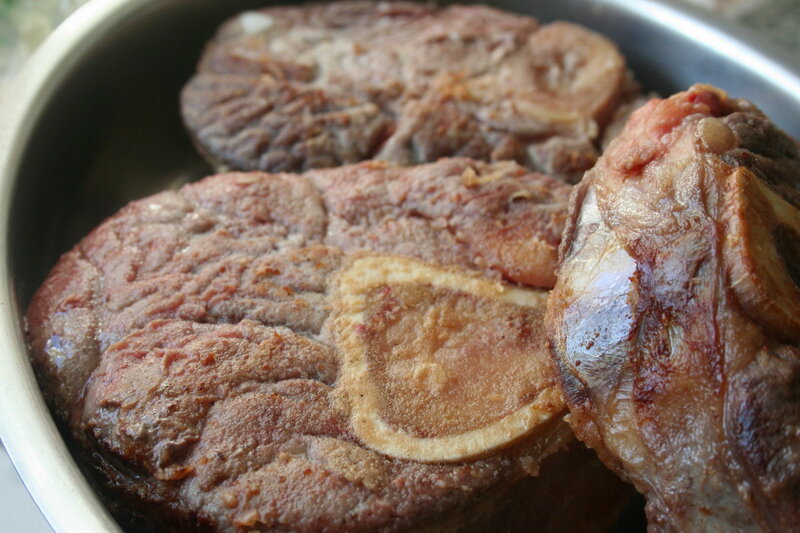 Problem is, we’ve still got plenty of beef for braising, and waiting ’til next year seems unwise, especially after our recent experience with year-old pork chops. Mmm. So I let myself to be suckered in by this chile recipe, from Aidell & Kelly’s Complete Meat Cookbook, seeing as how it didn’t really sound like stew and looked pretty darn easy to boot. Turns out to be a keeper. For such a simple preparation, the flavors were tremendous and played wonderfully with stewed beans and sauteed seasonal greens. And I love the minimal effort involved. It could be very easily adapted for a slow cooker if you wish. Soak the chilies in hot water for 20 minutes, or until soft. Meanwhile, cut the beef into 1-inch cubes and sprinkle with salt and pepper. Heat a heavy casserole over medium-high heat. Swirl in vegetable oil when hot and brown cubes in batches, about 6 minutes per batch, then set aside. When the chilies are ready, remove seeds and stems and place in a food processor along with onion, cumin, coriander, garlic, oregano, and ¼ cup of strained chile soaking liquid or water. Process to a puree. Pour puree into casserole along with browned meat, stock or beer, and enough water to cover the cubes. Bring to a boil, then turn heat down to low and cook for about 3 hours, until beef is tender. Feeds 4-6. The grill is now back in the rotation, and recently beef kebabs were on the dinner menu. But which cut to use? Aidell & Kelly’s Complete Meat Cookbook is unequivocal: not the pre-marinated kebab meat from the grocery store cooler, because you don’t know what you’re getting. What you do want is a cut with a bit of chew and lots of beefy flavor, meaning something like skirt steak, top round, sirloin, tri-tip, or chuck steak. Or something more tender, like tenderloin. I opted for a taste test comparing flank steak and top round steak, since that’s what the freezer yielded. (Tenderloin was not an option — you don’t get many of those, even with a quarter cow.) I sliced the flank thinly, cubed the top round, and both went into a gingery soy marinade overnight. Charlie skillfully undergrilled the beef just slightly, and we dug in with our friends Mark and Alice, both discerning omnivores. Accompaniments included a peanut sauce and a spicy mango sauce. The verdict? The cubed top round was assertively beefy in flavor and just a bit chewy. The flank was wonderfully tender but tasted as much of marinade as it did of beef. The consensus was that a smarter investigator would have pitted sliced top round against sliced flank, or cubed vs. cubed. But you wouldn’t go wrong with either cut of beef or angle of cut, even if the cubed meat was more kebab-like than the squiggly slices. Me, next time I’ll be slicing the meat and marinating less, for better tenderness and preserved beefy flavor. And no need for so many sauces — the kebabs are good enough that sauces are almost an afterthought. Thirty pounds of ground beef with our quarter-cow, but a gal can only eat so many burgers. So we’ve branched out. One recurring favorite is a big dish of meatballs with minty yogurt and rice pilaf, and another the lemongrass meatball, which we’ve just discovered this week. This smaller meatball makes for an easy, good looking appetizer, though admittedly the real discovery is the sweet chili dipping sauce, whose flavors make everything taste new. Combine meatball ingredients in a mixing bowl and shape into pieces the size of golf balls. Heat a skillet over medium-high heat. Swirl in 2 tbls vegetable oil. When hot, add meatballs without crowding. Moderate heat so the exterior browns but does not burn; turn meatballs every 3 minutes or so to cook evenly. They are done when cooked through, 10-12 minutes. Makes about 24 appetizer-sized meatballs. Meanwhile, mix the rice vinegar, water, chili paste, cornstarch, and sugar, ensuring that the cornstarch dissolves thoroughly. Heat mixture over high heat in a saucepan, boiling for 3 minutes or so until the mixture turns transluent. Cool before stirring in cilantro and serve alongside meatballs. Another simple, tasty use for all that ground beef from our quarter cow: English chef Simon Hopkinson’s savory mince, as featured in the Times food section two weeks back. I tweaked his recipe slightly, incorporating homemade tomato sauce, fresh garden herbs, and cured fatback in lieu of more standard ingredients, and it made for a hearty local meal after a long day of cleaning up the garden. Charlie, who once lived in London, declared it up there with the best English eating he’s done. I leave it to you, dear reader, to divine his meaning. Spicy noodles are my comfort food — I like to cook a bowl for myself whether it’s meal time or not. And they’re never really the same thing twice; I’m constantly tinkering with the ingredients. This particular adaptation uses a little ground beef plus the meaty Romano beans that I grew from my friend Caroline’s seeds. The only thing I don’t tinker with is the fresh tomatoes that get stirred in at the end. I know stir-fried tomatoes sound odd, but they really tie the sweet, salty, sour, and spicy flavors together. These days I’m chopping in the last stragglers from our garden and bonus, you don’t really notice that the fruit is barely ripe. Good timing for the very last of the summer crops. And, I get my noodle craving satisfied in fifteen minutes. Soak rice noodles in hot water for 10 minutes or more, to soften. Cut green beans into 1-inch pieces and tomatoes into ½-inch cubes. Thoroughly mix together fish sauce, sugar, lime juice, chili paste, and salt. Heat a heavy skillet over medium-high. Swirl in vegetable oil. 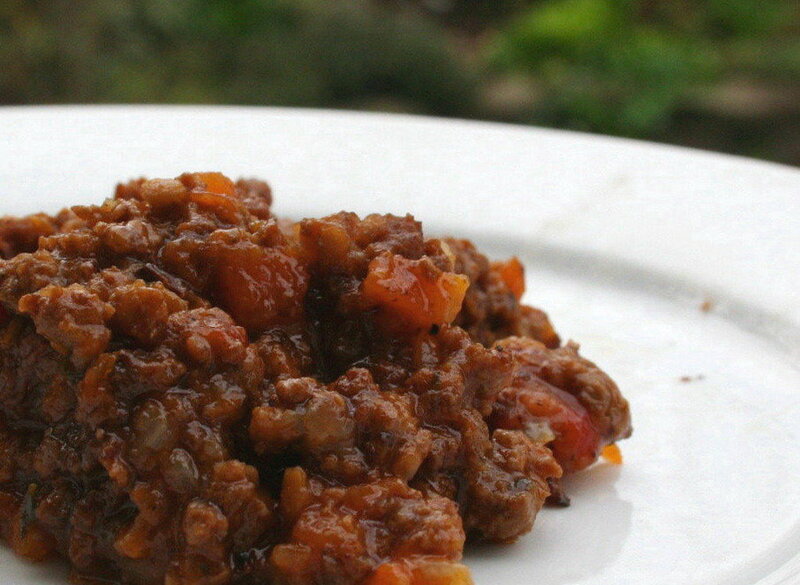 When hot, add ground beef, onion, and ginger and cook, stirring, until beef has lost its raw appearance. 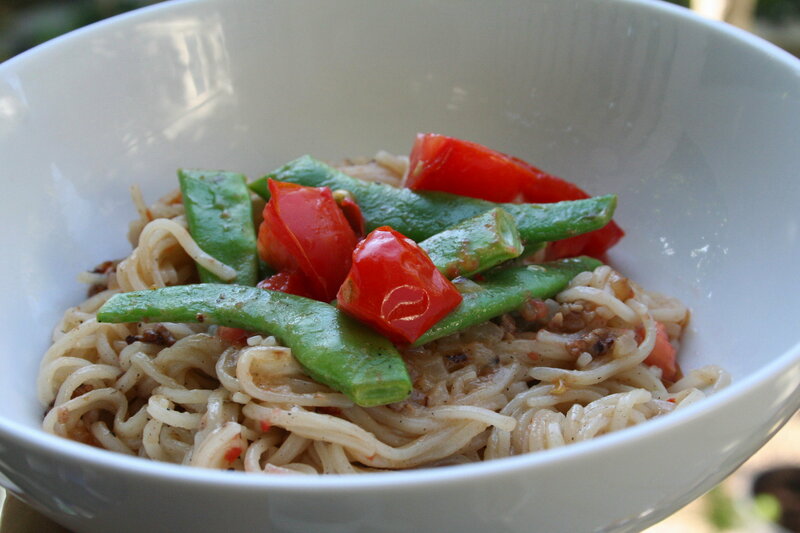 Add noodles, fish sauce mixture, ½ cup water, and green beans. Cook, stirring constantly, adding additional water to keep noodles from sticking if needed. When noodles are tender, about 5 minutes, mix in tomatoes and serve. Feeds 2. Seems like half the work of eating locally comes in securing ingredients, inevitably from some combination of scouting farmer’s markets, tracking down pastured animals, composting, and growing your own from dirt and sunshine. The next forty percent of the local eating puzzle, at least for me, is in contemplating old recipes and playing with new ones, the goal being to combine raw materials in simple but interesting ways, ways that enable the materials to shine. Those elements in place, the actual cooking often feels like a mere formality. Such was the case with this Julia Child recipe for carbonnade a la flammande, which translates more or less as beef braised in onions and beer as the Belgians do. We ate the carbonnade alongside a fresh tomato salad and pan-roasted potatoes with parsley, and it was one of the tastiest things we’ve done yet with our Lopez Island beef. The best part was that with ingredients on the premises and a bulletproof recipe at hand, it wasn’t such a stretch to get dinner to the table. Plus the carbonnade is a nice way to work that stew pot back into the kitchen rotation, and right now you can find all of the supporting ingredients at farmers markets or in the garden. Preheat oven to 300 degrees. Heat a heavy ovenproof pot over medium heat. Render the pork fat or warm the oil. Cut the chuck into thick steak-like slices, approximately 3″x1″x1″. Pat dry and brown the slices in the pot, 3-5 minutes per side. Remove and set aside. Add sliced onions and cook over medium heat until tender, about 10 minutes. Stir in garlic and a generous pinch of salt and a few grindings of pepper. Stir and cook for another minute or so, then remove and set aside. Add stock and bring heat up to high, scraping browned bits off the bottom. Remove from heat and add beef slices in a layer on the pot bottom. Sprinkle beef with salt and pepper, then cover with onions. Pour in beer, which should just cover meat, and stir in sugar. Tuck bay leaf into the center. Cover pot, place in oven, and bake for about 3 hours, until beef is falling apart. Check midway through: liquid should just be bubbling gently. Remove pot from oven and pour pot juices into a sauce pan, and turn heat to high. Dissolve cornstarch thoroughly into 2 tablespoons of water and add, along with vinegar, to the juices. Reduce quickly over high heat. Serve beef topped with onions and fresh parsley, with reduced juices poured over it all. Feeds 6-8. Adapted from Julia Child.